Not all records in the State Archives are open for inspection; some restrictions apply. 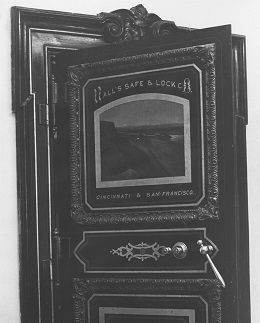 Safe located in the Secretary of State's Office in the State Capitol. State Archives control number NSC-0041. NRS 378.300 Period of confidentiality of confidential public records. Except as otherwise provided in NRS 239.0115, public records acquired by the Division which have been declared by law to be confidential must remain confidential for 30 years or, if the record relates to a natural person, until the death of the natural person, whichever is later, unless another period has been fixed by specific statute. NRS 239.0115 Application to court for order allowing inspection or copying of public book or record in legal custody or control of governmental entity for at least 30 years; rebuttable presumption; exceptions. 1. Except as otherwise provided in this subsection and subsection 3, notwithstanding any provision of law that has declared a public book or record, or a part thereof, to be confidential, if a public book or record has been in the legal custody or control of one or more governmental entities for at least 30 years, a person may apply to the district court of the county in which the governmental entity that currently has legal custody or control of the public book or record is located for an order directing that governmental entity to allow the person to inspect or copy the public book or record, or a part thereof. If the public book or record pertains to a natural person, a person may not apply for an order pursuant to this subsection until the public book or record has been in the legal custody or control of one or more governmental entities for at least 30 years or until the death of the person to whom the public book or record pertains, whichever is later. 2. There is a rebuttable presumption that a person who applies for an order as described in subsection 1 is entitled to inspect or copy the public book or record, or a part thereof, that the person seeks to inspect or copy. (a) Declared confidential pursuant to NRS 463.120. (b) Containing personal information pertaining to a victim of crime that has been declared by law to be confidential. NRS 239.012 Immunity for good faith disclosure or refusal to disclose information. A public officer or employee who acts in good faith in disclosing or refusing to disclose information and the employer of the public officer or employee are immune from liability for damages, either to the requester or to the person whom the information concerns. NRS 239.013 Confidentiality of records of library which identify user with property used. Any records of a public library or other library which contain the identity of a user and the books, documents, films, recordings or other property of the library which were used are confidential and not public books or records within the meaning of NRS 239.010. Such records may be disclosed only in response to an order issued by a court upon a finding that the disclosure of such records is necessary to protect the public safety or to prosecute a crime.